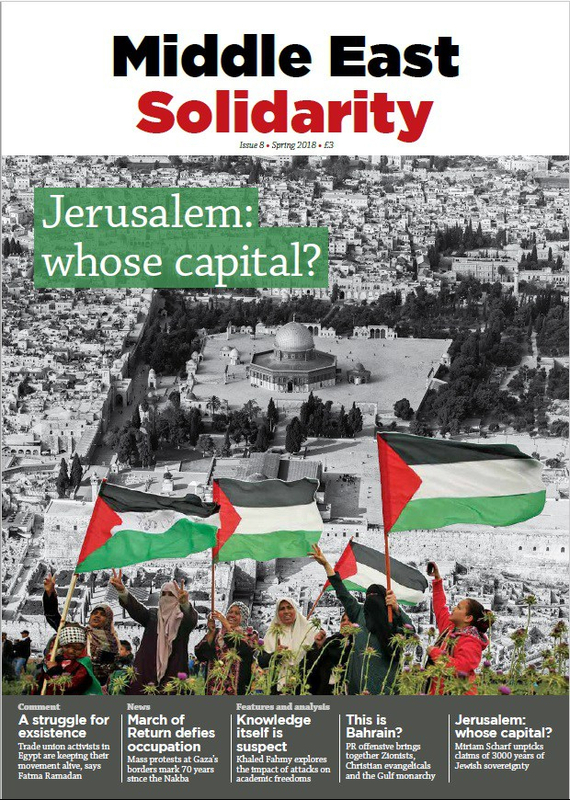 Middle East Solidarity magazine is now available to buy from Bookmarks bookshop for £3 or can be downloaded as a pdf [MESM_9_FINAL_lowres]. Contact Bookmarks if you would like to make a bulk order for your trade union branch (discounts available). The brutal rulers of Arabia have treated the country as their personal property for generations. Ameen Nemer assesses the state of resistance to Saudi rule. Lead actor in ‘The Jungle’. Ammar Haj Ahmad interviewed about his journey from Syria to the West End. What lies behind Trump’s attack on UNRWA’s support for Palestinians? 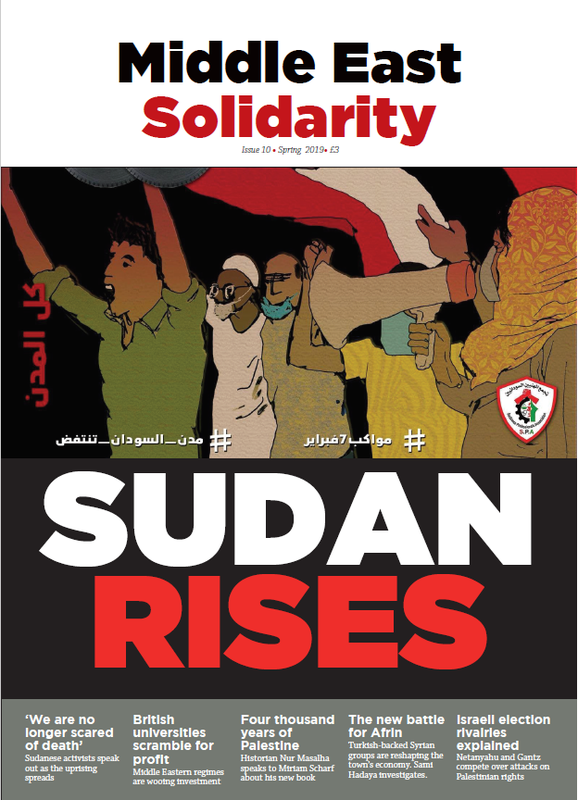 Middle East Solidarity magazine is now available to buy from Bookmarks bookshop for £3 or can be downloaded as a pdf [MESM 8 FINAL_lowres]. Contact Bookmarks if you would like to make a bulk order for your trade union branch (discounts available). Right-wing Zionists, Evangelical Christians and Bahrain’s repressive monarchy are working together to burnish the royal family’s tarnished image. The Egyptian authorities’ fear of academic inquiry has led to tragic results, Khaled Fahmy argues. Qatar: a major step forward for workers’ rights? Does Rouïba’s revolt herald Algeria’s coming storm? NB. Bookmarks bookshop is closed the week beginning 3 July, but print copies are available from Student Central. Print copies will also be available from Duck and Dive bar throughout the Marxism Festival, and from the week beginning 10 July back at Bookmarks. Anger and frustration flares into strikes and protests as the Sisi regime imposes subsidy cuts, drastic austerity measures and attacks on workers’ living standards. Mehdi Rafiq analyses the state of Morocco’s social movements after a new upsurge of protest engulfs the impoverished North East of the country. Middle East Solidarity’s special investigation explores the European foundations of the Egyptian security state. In figures, the arms and security deals which equip Egypt’s security forces and military. Ceasefire talks involving opposition and regime forces in Syria will be driven by imperialist competition to dominate the country from without, not by the needs of its people, warns Ghayath Naisse. First person: Britain teaches our government how to cover up, says Farida Ghulam, a leading figure in Bahrain’s opposition al-Wa’ad Party, and wife of political prisoner Ebrahim Sharif, the party’s secretary-general. Morocco – Sparks of resistance to austerity: Medical students and trainee teachers take on bursary cuts while candle-lit marches challenge electricity price hikes: Mohamed Boutayeb reports. Challenging the climate of fear: Across Europe, governments are fuelling racism and Islamophobia through new counter-terrorism laws. 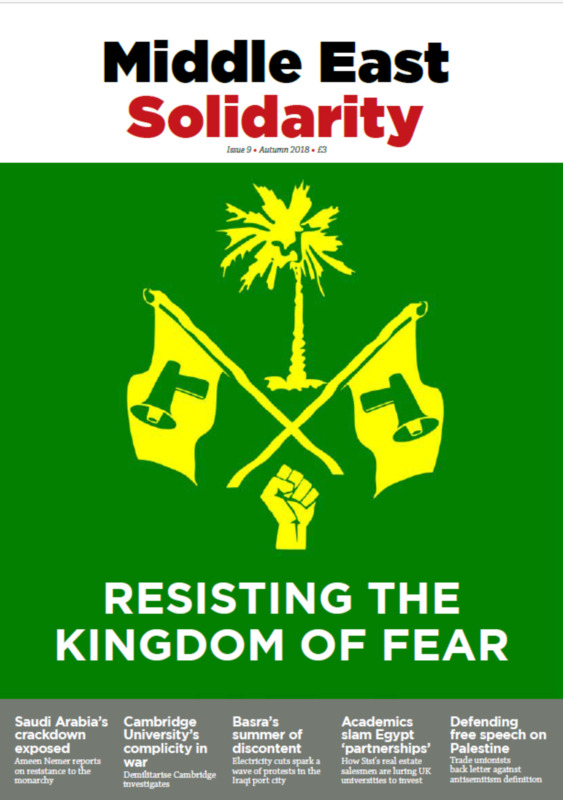 Middle East Solidarity speaks to activists from Britain and France who are on the frontline of resistance to these tactics of divide and rule. Global University Inc. Are UK universities are putting lucrative research and teaching contracts before human rights and academic freedoms? Events in the Middle East often dominate the news, but it is the stories of war, sectarian violence and western military intervention which grab the headlines. Middle East Solidarity shows a different side to the region. We report on resistance to repression and imperialism from Morocco to Yemen, covering the strikes and protests which are missed by the mainstream media. We hope to carry the voices and stories of the women and men who are still fighting for bread, freedom and social justice to new audiences. Our practical guides to campaigning and resources for activists aim to build a stronger solidarity movement. 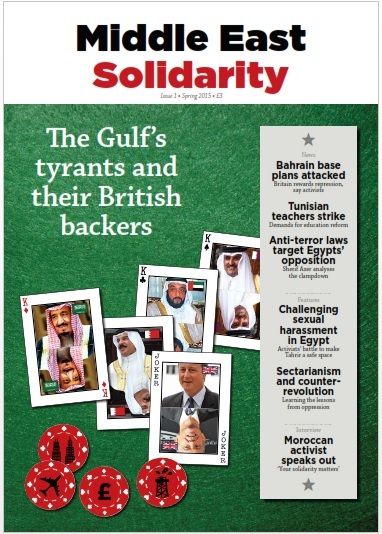 Middle East Solidarity is a joint project of MENA Solidarity Network, Egypt Solidarity Initiative and Bahrain Watch, and is supported by funding from UCU, PCS, NUT and a number of Trades Union Councils and local trade union branches.